1 April 2008: Born to a wealthy family in Jakarta in 1948, Fauzi Bowo graduated from the Jesuitical Kanisius school in the capital before attending the University of Indonesia to study architecture. While at university he was involved in the Indonesian Students Action Front, a counter-revolutionary group organising against Marxist militants in the Indonesian Students Union. In 1968 he moved to West Germany to attend the Technical University of Brunswick, where he graduated with a PhD in town planning in 1976. the governor was shortlisted for the 2008 World Mayor Award. 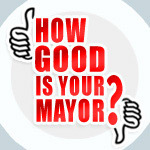 Update 21 September 2012: Fauzi Bowo lost the September 2012 gubernatorial elections to Joko Widodo, Mayor of Surakarta. 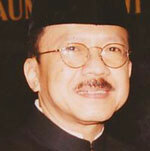 In 1979 he began his career in Jakarta's regional administration with the Jakarta Regional Bureau. During this time regional power had been usurped under President Suharto's New Order dictatorship, though as capital Jakarta was designated as having Special Capital Region status. From 1983 to 1997 (ostensibly the latter period of Suharto's dictatorship) Bowo acted as the treasurer for the ruling Golkar (Partai Golongan Karya), now a nominally centre-right party based around the principles of Pancasila (the central tenets of Indonesian governing philosophy - God, justice, nation, democracy and compassion). Pancasila as envisaged by the founders of the Indonesian state differed immeasurably from that of Suharto, who purged it of any benign western influences (including that of Gandhi’s political thought) and emphasised Javanese feudal values. As a government administrator, Bowo was a member of the Birokrasi (Bureaucracy) faction of the state party, as opposed to Suharto's ABRI (military) faction. In 1998, following the downfall of Suharto, the party reformed itself considerably, though this did not prevent its rejection at the polls. In response to the 1998 protests which led to the downfall of Suharto, by now a global pariah for his genocidal regime and human rights abuses (most notably in East Timor), the Indonesian state began to decentralise many government functions to the provincial level and encouraged the direct election of provincial governors, including Jakarta. Bowo first mulled a run for governor of the capital in 2002, though he was persuaded to stand aside and instead act as deputy to the former general Sutiyoso. During this period the regional authority introduced the TransJakarta bus rapid transit system to the capital (modeled on Bogotá's TransMilenio system). In August 2007, having obtained the support of Golkar and the other two main parties, Bowo became the first directly elected governor of the Special Capital Region of Jakarta on a five year mandate. Regarded as a shoo-in by dint of incumbency, Bowo ran with the support of the military also, choosing Prijanto as his running mate. Though as Muslim (like over 80% of the city's inhabitants), Bowo offended the religious sensibilities of a number of conservatives by participating in a Christian church's Easter service before the election. Bowo is married to Sri Hartiti Bowo and they have three children. The Special Capital Region of Jakarta is subdivided into five cities (kota), each headed by a mayor, and one 'regency' (kabupaten), a special unit to administer the Thousand Islands group.